Taglines are perhaps the most underrated and underused elements of personal and business blogs, yet they serve a huge function. The social web has conditioned us to move through content-based sites quickly, and if we reach a site with an unclear thesis we’re likely to click to the next thing. You also can’t count on visitors to read your “about” page. In a world that increasingly moves at 140 characters or less, having a hook such as a clever tagline can make all the difference. Taglines are your brand’s elevator pitch and help people get a quick snapshot of who you are. It’s your opportunity to be descriptive, catchy, memorable and create a unique brand for your blog. They also present a great opportunity for keyword inclusion, but not at the sacrifice of stickiness. Ideally you can combine something catchy and SEO friendly. 22. Geek Sugar: Geek is chic. 23. Smashing Magazine: We smash you with the information that will make your life easier. Really. 26. Simply Fired: If you don’t laugh, you’ll cry. 30. SEO Book: Learn. Rank. Dominate. 44. Don’t Drink The Kool-aid: Join the conversations. Just don’t drink the Kool-aid. This is of course an incomplete list, so we’ll turn it over you. Share your favorite blog taglines in the comments that you think are creative, clever or effective. 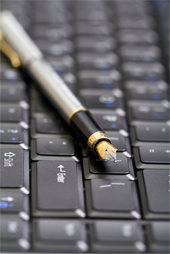 How about “The business of writing for business?” Does that draw a clear picture? I spent more time on that tagline than I’d care to admit. Thanks Adam! Now I’ll have to create some more “uncanny content”..
Good point! The importance of the tagline should never be underestimated. I think it’s a fun one. haha the last point “For blogs with non-descriptive names, taglines become even more important” is true – my blog (my name) had the tagline The Dialogue Is The Content in 2005. But recently I changed it to The Business of Being Social.It is on online communities. Interestingly, I advise clients to name their microbranded network for the Purpose but use the Tagline for value systems. e.g. The Harley Davison Community (Purpose) with the tagline Medice, cura te ipsum! – will attract doctors with bikes for recreation rather than bikers with hoggers for serious. It’s a bit long, but pretty much sums it up. Recently I’ve been getting particularly snooty and obnoxious about bad writing in my posts. To reflect that, I am thinking of changing the tagline to “Did I mention that I had a PhD from Cambridge?”. Unfortunately, I suspect a lot of people wouldn’t realise that such a tagline is just me being snootily obnoxious towards my own self-important writing! Well, it is really a must to have taglines that are catchy and striking. Taglines allow us to be searched and at the same time to be noticed. In business and for e-marketers, taglines shows their uniqueness from others. Hence, it is important to work on something that is striking and unusual. Something new always catches others’ attention. Need help with understanding ecommerce? Visit my blog and learn how to profit from ecommerce. I had a great tagline writer. My dad wrote it for his saloon (blog is it’s legacy) which opened on the day Prohibition was repealed… in 1931, I think. You have got me thinking now. My tagline is very boring in comparison. I am going to brainstorm some new tagline ideas. What about my blog’s tag line? catchy and funny, but I am not sure I would personally ready something that sounded so egotistical. What would it be about exactly, just you? That was a great list. Taglines should never be underestimated. I think they’re the ones that really define your blog, don’t you think? I personally think that the taglines can make or break you. People know just by the sound of it if it’s interesting enough to them. I’d say that the headline/tagline is the number one most important piece to draw in an audience. which is the key for everyone here, read and learn how to do this on your own blog. These are some really good taglines, thanks for sharing. Taglines are a great way to attract peoples attention so you need to make sure it is catchy. The only problem? I’m not just a reporter of the web, I’m a marketer. The tagline doesn’t reflect that. That is a good one, but I see what you mean about not incorporating the other aspect (marketing). Maybe start another blog that focuses on marketing too? Great post! One way to write a great tagline is to read others. Writing a tagline is not the easiest thing to do so hopefully hearing some other creative lines will spark an idea. Bottom line, don’t worry too much about the tagline. Worry about the content. Fun romp through a part of marketing that few pay enough attention to! Feel really pity because I have underrated the taglines. Thanks for changing my mind. Is a Blog about trying to live a more balanced life in this sometimes chaotic world. It includes my quest for quitting my job and FINALLY Doing what I Love. Wow. I'm impressed by the number of links there. I have a blog that is running a series on Marketing Blogs. Perhaps your readers may also be interested.